On February 18th the Board of Directors at The Coca-Cola Company approved an increase to their quarterly dividend. Again. Just like they have for 54 consecutive years now. The previous payment was $0.33 and the new payment is $0.35. Considering the currency headwinds that the company is undergoing that's a very solid 6.06% increase. Coca-Cola is one of the premier companies that can be found on the Dividend Champions list and likely in many dividend growth investors' portfolio. The current yield on Coca-Cola shares stands at 3.20%. I own 163.541 shares of Coca-Cola in my FI Portfolio so this dividend increase grew my forward 12-month dividends by $13.08. This is the 5th dividend increase I've received from Coca-Cola since initiating a position in September 2011. 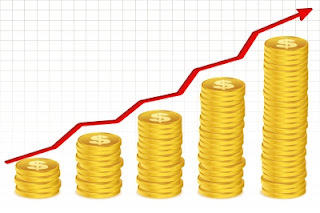 Cumulatively the income on my first lot of shares has increased by 48.9%! According to USInflationCalculator the total inflation for that same time period sits at 5.3% so Coca-Cola is far outpacing inflation and increasing my purchasing power. I also own 5.857 shares of Coca-Cola in my Loyal3 portfolio so the increase boosted my forward 12-month dividends in that portfolio by $0.47. The average analyst estimate for earnings for Coca-Cola for fiscal year 2016 stands at $1.94 so the new dividend rate represents a forward payout ratio of 72.2%. Based on the TTM free cash flow and the current diluted weighted shares outstanding the new dividend rate represents a 72.2% free cash flow payout ratio as well. The payout ratios are getting on the high end although that's partially to blame from the strong USD and currency exchange issues that was a 7% headwind for fiscal year 2015. Consistency is the name of the name of the game when it comes to Coca-Cola's dividend increases. 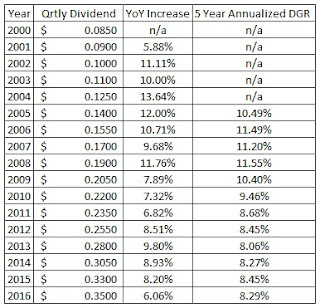 Although dividend growth has been slowing down both in year over year terms and rolling 5 year growth rates. However, as FX issues subside and become a tailwind when the USD begins to weaken Coca-Cola could return to the 7-8% annual growth seen in the recent past. There were some positives in the 4Q earnings release with global volume showing a 3% increase and still beverages showing a solid 6% volume increase. The US even showed gains in both sparkling and still beverages potentially signaling a return to growth in the domestic market. My forward dividends increased by $13.08 with me doing nothing. That's right, absolutely nothing to contribute to their operations well other than purchase some of their products. Based on my portfolio's current yield of 3.24% this raise is like I invested an extra $404 in capital. Except that I didn't! One of the companies I own just decided to send more cash my way. That's how you can eventually reach the crossover point where your dividends received exceed your expenses. That's DIVIDEND GROWTH INVESTING AT WORK! That's the beauty of the dividend growth investing strategy because you build up your dividends through fresh capital investment as well dividend increases from the companies you own. 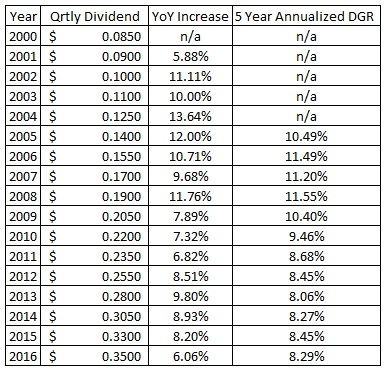 I've now received 8 dividend increases thus far in 2016 adding $50.04 to my forward 12-month dividends. February dividend growth bonanza is just about over with just one more of my holdings likely to announce an increase. Although there's no complaints since I've already had 5 of my holdings boost my income. My FI Portfolio's forward-12 month dividends are up to $5,548.00 and including my Loyal3 portfolio's forward dividends of $62.49 brings my total taxable account forward dividends to $5,610.49. Do you own shares of the Coca-Cola Company? Did you find the dividend increase refreshing or coming up flat? I love the smell of dividend raises in the morning. CO is such a great company and it's been around so long with such positive results. You made a great investment when you first decided you would initiate a position. I think the only tough part with investing in CO is trying to ignore how great its main competitor, PEP is. Anyways, good to see your raise and let's see the snow ball continue to roll! That's a much more positive take on the Apocalypse Now quote! My solution to the KO vs PEP dilemma is simple: own both. I like PEP a lot for their diversification with the snacks business. But KO is a giant in the beverage business with huge scale. I personally like the S&P. With a TTM dividend rate of 2.38%, is is only 1% behind Coca Cola. There is more room for growth and less volatility. Coke could go to 0, and the world would still spin. If the S&P goes to 0, it will be kayos. I might throw in that if KO goes to 0 there will be just as much chaos. I don't know about the updated numbers but KO products accounted for something like 3% of global liquid consumption. Interestingly enough based the current starting yields for both and a 5.5% growth rate for KO and a 10% growth rate for the S&P 500, the S&P 500 would surpass KO in terms of YOC 7 years from now. Although I don't know if the S&P 500 has typically delivered 10% annualized growth I just ballparked it. Back it down to 8% and it would need 12 years. Although that does ignore the cumulative dividends received and the fact that you could reinvest those KO dividends sooner. KO is treating you well. You must be a happy camper! I am torn these days. As I gain more to invest, I can never decide between debt instruments or DGI. Debt instruments are winning these days as I like the low Beta. I think the pendulum will swing though at least within a few years. Especially if the AA gets out of round. Definitely no complaints thus far with almost a 50% improvement in my income.